Special Counsel Robert Mueller’s Russia “probe” has been a total witch hunt trying to ruin everyone in President Donald Trump’s inner circle, critics say. But it looks like Mueller’s overzealous team is about to unleash a MAJOR unintended consequence. And it could land former Secretary of State John Kerry behind bars. Yesterday, the Department of Justice charged two associates of former Trump National Security Advisor Michael Flynn with being unregistered foreign lobbyists, working on behalf of Turkey. It’s unclear if there is any merit to the charges (and wasn’t this supposed to be a Russia probe anyway?). But one thing is perfectly apparent. If the Justice Department is going to start cracking down on violations of the Foreign Agents Registration Act, Kerry is in very big legal trouble. 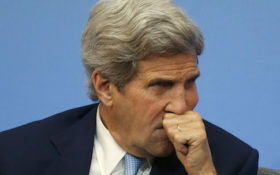 It was widely reported that Kerry secretly met with Iranian officials in May to try to salvage the disastrous Iran nuclear deal, enacted under former President Barack Obama. But Trump had made clear that he was dissatisfied with the pact and wanted to pull out — so Kerry sure wasn’t working on behalf of the American government. There appears to be ample evidence that he broke the law, after all. Failing to prosecute him would constitute a dangerous double standard — and would call into question the legitimacy of the Mueller probe. kerry is guilty and had no authority going to iran representing a past administrations interests…he needs to go to prision…..